Vato Tsikurishvili as Cyrano de Bergerac and Maryam Najafzada as Roxanne in “Cyrano de Bergerac.” Photo by Johnny Shryock. We’re all fools in love, and this is no less true for the characters in “Cyrano de Bergerac,” an imaginative new incarnation of the classic French play produced by Synetic Theater. 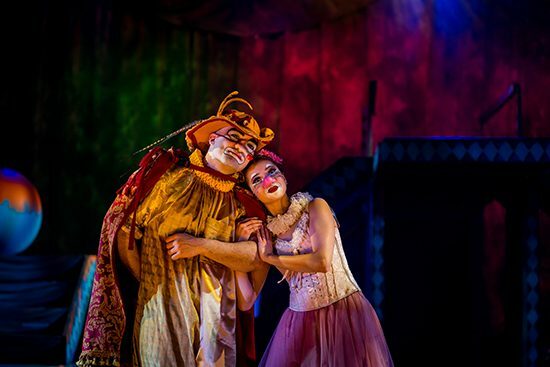 Another in the theater’s wordless productions that include no dialogue, “Cyrano” is a genre-defying tragicomedy that delivers on the company’s brand of avant-garde entertainment. The director, Vato Tsikurishvili, (also in the titular role), approaches the story at an oblique. Entering the theater, viewers are confronted with a psychedelic wonderland resembling a child’s playroom (scenic design courtesy of Phil Charlwood). Instead of the 17th-century nobility of Edmond Rostand’s original play, all the characters are cast as clowns, an unexpected and brilliant choice that unmoors the story from a specific setting or period. … a genre-defying tragicomedy that delivers on the company’s brand of avant-garde entertainment. Despite the aesthetic departure, the plot follows the outline of its source material, telling the tale of Cyrano de Bergerac, a long-nosed wit who suffers from unrequited love for the beautiful Roxanne (Maryam Najazada). Here, the director imagines a childhood friendship, opening the show on a heartwarming scene that sees the two young friends tumble and play together. This innocent time demonstrates the depth of their relationship, casting them as chums before the complications of romance exist. When we next see Cyrano, he has grown into his wit, and his nose, as an adult. In his playbill notes, Tsikurishvili says he chose clowns as his aesthetic to represent how wit and humor can be used to mask and hide melancholy, as it did for screen icons like Charlie Chaplin and Buster Keaton. It’s a creative risk that works for the story, and also highlights the relativism of what Cyrano sees as his “deformity,” his long nose since most of the characters are sporting clown noses. Maryam Najazada gives a beautifully rendered performance as Roxanne. Reintroduced as an adult during a spectacular dance sequence, she is appropriately outfitted in pale pinks. The styling makes her appears delicate and bird-like, as do the giggles and gasps she emits when she meets the handsome Christian (an excellent Matt R. Stover) after her dance performance and falls in love. Najazada’s finely honed characterization allows Roxanne to be charming without being twee. Vato’s Cyrano is endearing as the vulnerable intellectual. Agreeing to help the not-suave Christian woo Roxanne, he undertakes to help the man write her love letters. A scene juxtaposing Christian and Cyrano’s style of writing cleverly uses choreography (courtesy of Irina Tsikurishvili) to express Cyrano’s own romantic passion for Roxanne. In a later surreal sequence, Cyrano is confronted with a world where everyone has a nose identical to his, a moving moment of self-reflection that reveals his underlying insecurity. A further complication arises in Cyrano’s romantic scheme with Christian when another suitor arrives, in the form of the military commander De Guiche. A (very) decorated drill sergeant, who commands via kazoo, De Guiche is played as a gleeful tyrant by Philip Fletcher. Rejected by Roxanne, who only has eyes for Christian, De Guiche sends both Christian and Cyrano into the army, and eventually, off to war. Befitting their clown characters, the actors pantomime the story using broad gestures and exaggerated expressions. Alison Samantha Johnson’s makeup design—especially Roxanne’s wistful eyebrows and Cyrano’s more somber face paint—underpins the success of these expressive performances. As always, the narrative is also underwritten by Synetic’s excellent production values. Brian S. Allard’s lighting seamlessly signals love, anger and despair, working in concert with Konstantine’s Lortkipanidze’s energetic score, which includes everything from humorous accordion, to slow jam love songs, to menacing synth. Cyrano’s somber looks become more severe as the show continues, and the war’s perils lead to a revelation of Cyrano’s real feelings for Roxanne, ending in tragedy for Christian. It’s a dark turn that segues into a beautiful, bittersweet ending for the two childhood friends. Like Chaplin’s character, the Little Tramp, Cyrano is unlucky in his romantic pursuit. But like Chaplin’s films, “Cyrano” is a funny, moving, emotionally satisfying journey to watch. Running Time: About 2 hours with no intermission. Advisory: This production is recommended for ages 6 and up and includes audience participation. 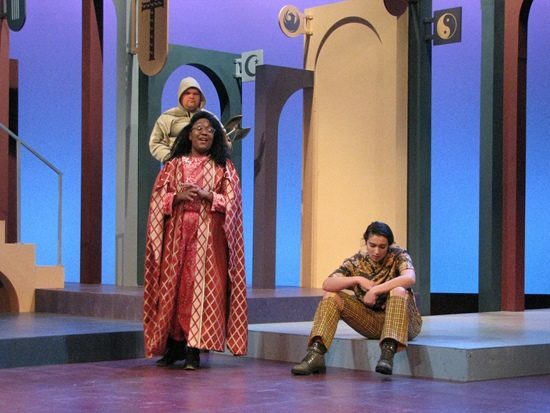 “Cyrano de Bergerac” runs through March 10 at Synetic Theater. For tickets or more information, click here.